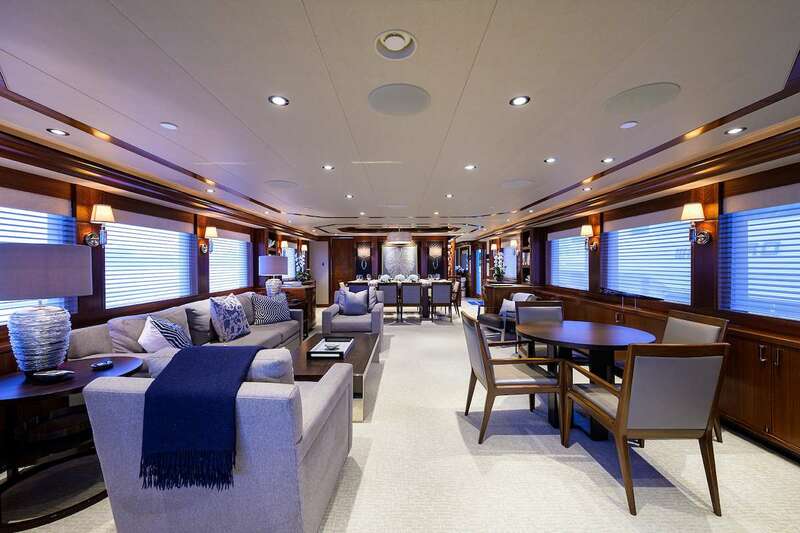 Main Salon: Earthy tones in leather, fine fabrics, sapele and mahogany compliment this space with a welcoming lounge area to port and a game table to starboard. 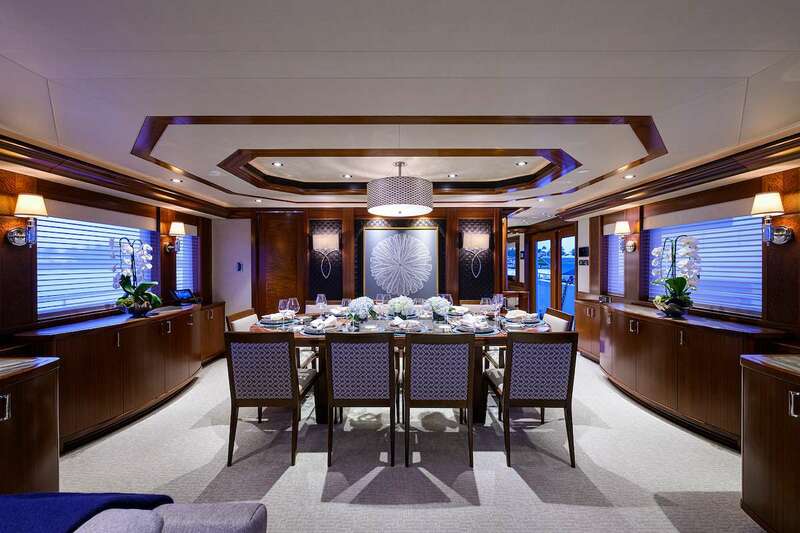 A formal dining area is forward, and a day head is situated on the starboard side just forward of the main atrium. 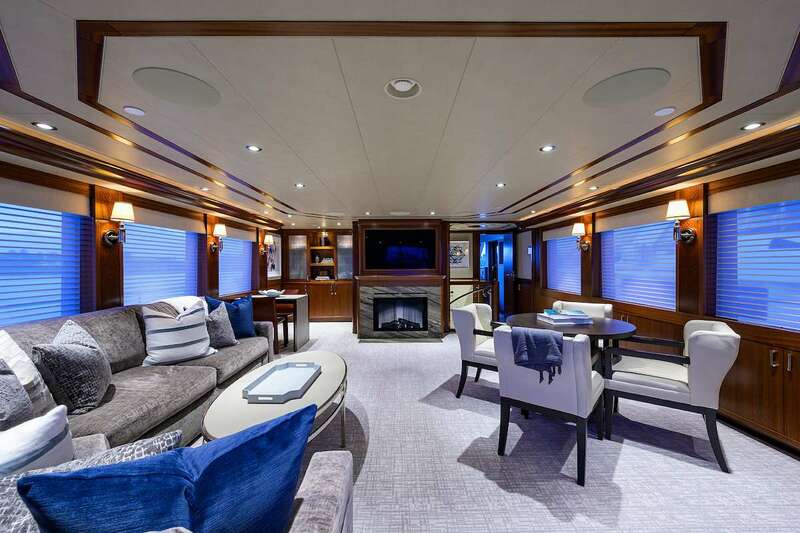 Aft Deck: A 42” outdoor LCD TV is located above the bar with 3 bar stools and is visible to the large al fresco dining table for up to 10 guests. Bench seating and two cocktail tables are situated aft of the dining area. The aft deck has wind doors to protect guests from windy conditions while dining. Bow: Walk-around decks lead to the bow which is a great place for sunning. Lounge chairs on the bow deck area forward allow the full sensory experience while underway – you may even catch a glimpse of dolphins frolicking in the bow wake! Swim Platform: the swim platform is accessible via two stairwells (port and starboard) from the aft deck and is the perfect spot to board your Jet Ski’s or kayaks. 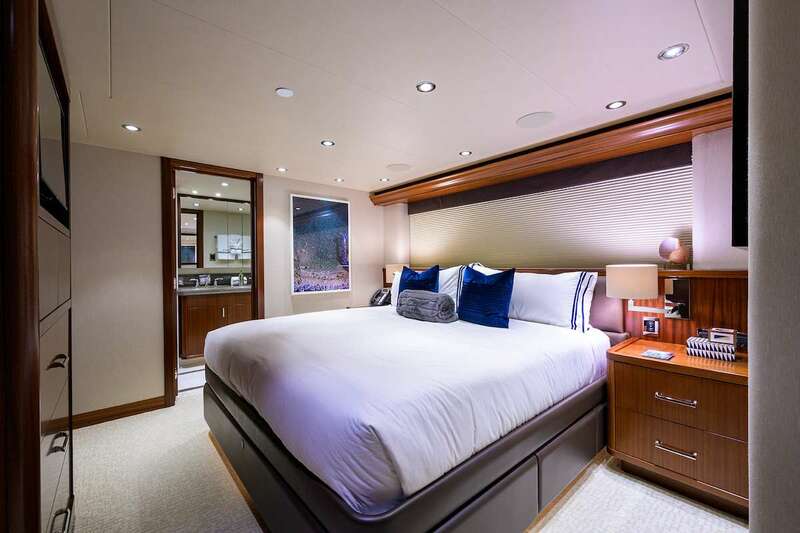 Master Stateroom: Situated forward on the main deck and outfitted in a soothing neutral color palette, the master stateroom features a centerline king-size bed facing aft with two nightstands, dresser, vanity with mirror, his and hers walk-in closets. 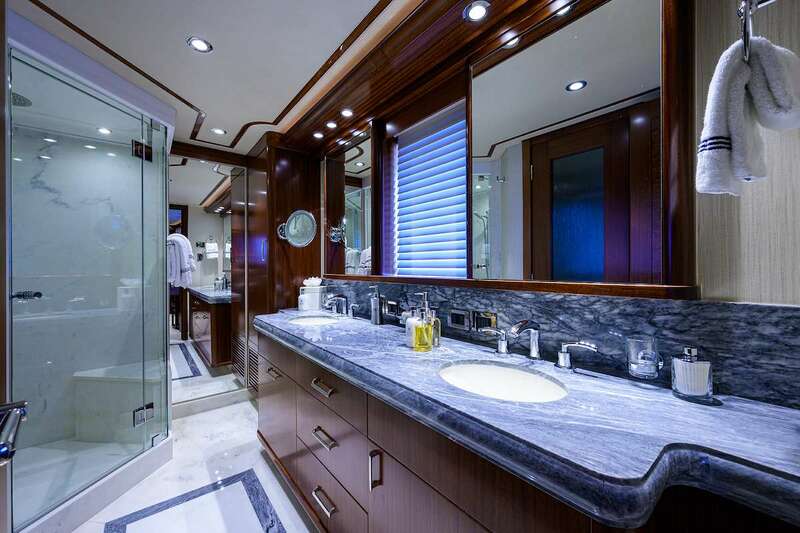 The en-suite features a private head and bidet locker, a shower, and twin sinks. There is a separate private office area with desk, and the entertainment center has a 42” LCD TV, Blu-Ray, DVD/CD player, iPod dock, and surround sound. Each detail has been carefully integrated to ensure the utmost in comfort, from the Egyptian cotton linens to the bedside docking stations. Wake up to enjoy the view from the large windows to either side of the master stateroom or keep the blinds closed for a post-sunrise sleep-in. 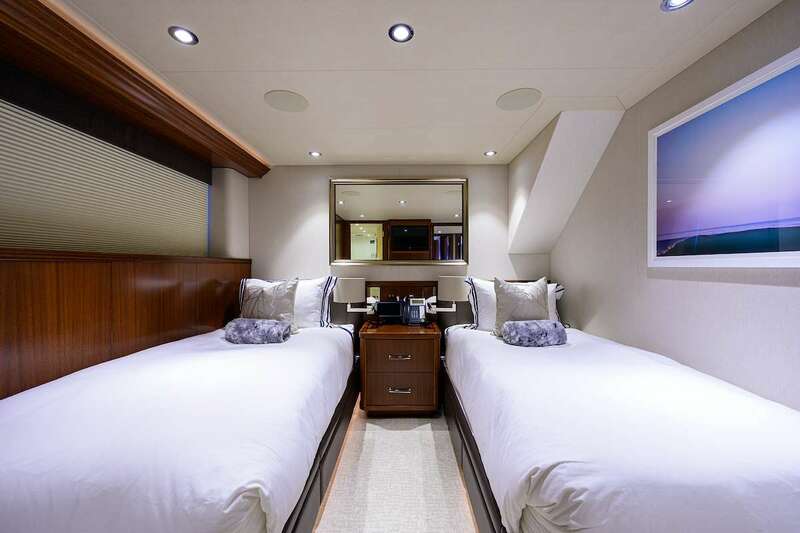 VIP Stateroom 1: Aft lower deck to Port: centerline king-size bed with two night stands, dresser, and closet. The en-suite features a head and bidet, twin sinks and a shower. The entertainment center has a 32” LCD TV, Blu-Ray, DVD/CD player, iPod dock, and surround sound. 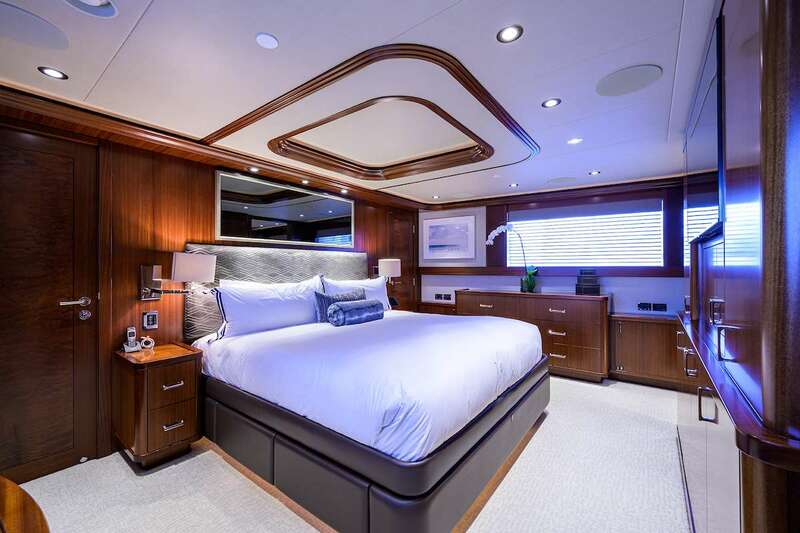 VIP Stateroom 2: Aft lower deck to Starboard: centerline king-size bed with two night stands, dresser, and closet. The en-suite features a head and bidet, twin sinks and a shower. The entertainment center has a 32” LCD TV, Blu-Ray, DVD/CD player, iPod dock, and surround sound. Twin Guest Stateroom 1: Forward lower deck to Port: two single beds with night stand, dresser, and closet. The ensuite features a head, sink and a shower. The entertainment center has a 26” LCD TV, Blu-Ray, DVD/CD player, iPod dock, and surround sound. Twin Guest Stateroom 2: Forward lower deck to Starboard: two single beds with night stand, dresser, closet. The ensuite features a head, sink and a shower. The entertainment center has a 26” LCD TV, Blu-Ray, DVD/CD player, iPod dock, and surround sound. Sky Lounge: A superb entertainment area, the sky lounge is outfitted with a state-of-the-art entertainment system with 55” HD TV, Blu-Ray, DVD/CD, iPod dock and surround sound, games tables and a wet bar. Relax and unwind next to the fire whilst enjoying a board game or movie from W’s vast selection. A small desk to port is a great place for a game of chess or to catch up on your emails. And another game table is situated on the port side. 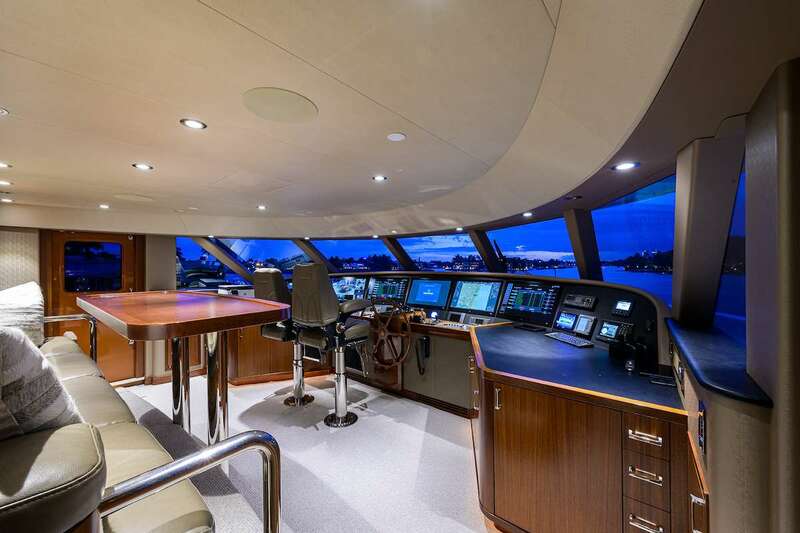 There is also a small wet bar aft. 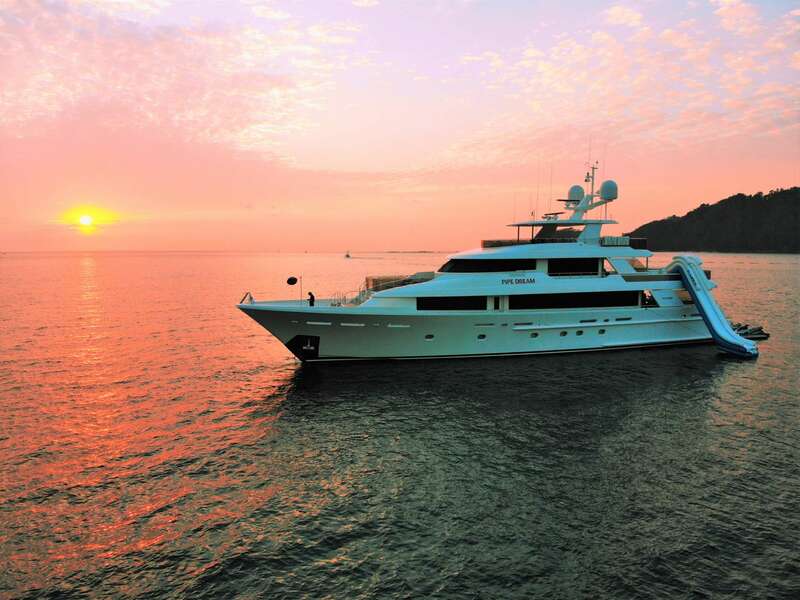 The day head is accessible on the starboard side just forward of the sky lounge.